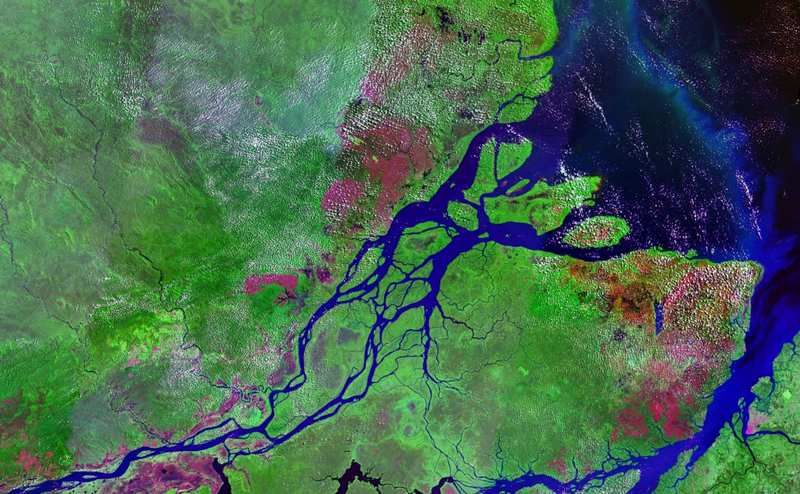 It's incredible that it escaped notice for so long, but scientists have just discovered a massive, 9500 square-kilometre reef system at the mouth of the Amazon river. And it's home to some truly bizarre life forms. When we hear "reef", we typically think colourful corals and crystal-clear tropical waters. Which is probably why nobody ever bothered to look for one at the outflow of the world's largest river. Discharging up to 300,000 cubic metres of sediment-loaded water every second, the Amazon river generates a thick, smog-like plume that darkens the surrounding seafloor, depressing light and oxygen levels. So you can imagine the surprise of the scientists who discovered a large reef system — built mainly of sponges and algae — sitting right beneath it. "More of these sorts of non-coral reefs have been discovered in recent years," Fabiano Thompson, an oceanographer at the University of Brazil, told Gizmodo. "But we are not aware of this exact type of reef in other places. A special system has been formed here." To be fair, folks have been finding corals and other reef-building organisms near the mouth of the Amazon for years. But it wasn't until Thompson and his colleagues began an extensive field survey back in 2012 that anybody had a clue how widespread this ecosystem was. Dominated by sponges and crust-forming red algae called rhodoliths, the reef stretches along a 1000 kilometre strip of shallow, outer continental shelf, from the French Guiana border to Brazil's Maranhão State. A paper describing the find appears today in Science Advances. Because the reef cuts across the mouth of the Amazon, environmental conditions change dramatically along its length. In the north, the river plume casts a heavy shadow, rendering both light and oxygen scarce. Further south, the water becomes clearer, sunnier and well-aerated. This, in turn, has resulted in distinct ecological communities along the length of the reef. In the southern portion of the reef, the food chain is based on photosynthetic algae that produce sugar from sunlight to support a diverse mixture of sponges and corals. But as one travels north, the sunlight disappears and the ecological landscape changes. Tiny green algae are replaced by a more exotic class of primary producers, microbes that can make their own food by stripping energy from inorganic chemicals. Scientists call this process chemosynthesis. Chemosynthetic microbes are prominent in extreme environments, such as deep ocean vents or subterranean lakes, but rarely are they numerous enough to sustain a large, macroscopic ecosystem. "This is the first chemosynthetic reef that uses minerals like ammonia and sulphur to sustain the reef instead of light and primary production," Thompson said. "This could make the system quite unique." Unique as it may be, the northern Amazonian reef joins a growing number of reefs worldwide that are entirely distinct from the coral-dominated archetypes we know and love. Colourful "sponge gardens", for instance, thrive off the west coast of Australia and the coast of British Columbia. Meanwhile, there are spectacular deep sea corals living miles beneath the ocean's surface where the sun never shines. It's possible, Thompson said, that chemosynthesis helps sustain some of these hardy bottom dwellers, as well. Although we've just begun to explore it, that Amazonian reef faces numerous human-caused threats, from offshore oil and gas drilling to industrial fisheries to climate change. As coral reefs around the world continue to suffer from the largest bleaching event on record, discoveries like this one remind us why it's so important to protect fragile marine ecosystems. Imagine all the other wonders we haven't yet discovered.